Factual error: At the end, Denzel Washington's character has a Grand Mal Seizure. But he is supposed to have a spinal cord injury. He can still have seizures in that the electrical impulses in his brain go haywire, but if he has a spinal cord injury that prevents him from moving, the seizure action in his brain wouldn't translate to his body jerking and shaking. Continuity mistake: In the scene where Amelia is driving the truck full of policemen to the scene of the second (Mrs. Rubin) murder, the shot changes a couple of times before it settles looking through the front windscreen at Amelia. Through the rear windscreen of the truck, you can clearly see the highway and all the cars on it behind them. Amelia turns the steering wheel sharply to the left, and you hear the screeching rubber-tyres-on-tarmac noise as if she really had swerved left, but the scene of the highway behind them seen through the rear screen does not alter at all - as if she was just going in a straight line all the way. 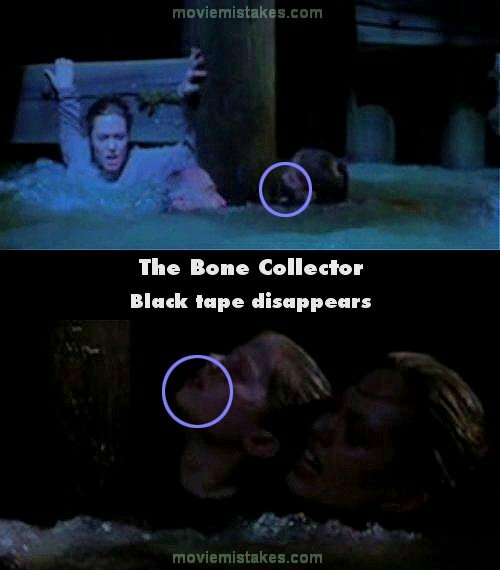 Continuity mistake: When Amelia jumps in the water to save the the little girl there is tape on her mouth. A moment later, the tape is not visible. Continuity mistake: Nearly at the end of the film Amelia falls into the sea to get the old man and the girl out of there. Her clothes of course get wet, but later when she discovers the taxi of the murderer her clothes are dry. Continuity mistake: When Rhyme is playing chess on his computer, the piece movements don't match the voice commands he gives. Visible crew/equipment: During the very first scene of the movie with Denzel walking toward the crime scene, the shadow of the camera is on the back of his shirt, below the NYC crime scene lettering. Character mistake: In the scene where Denzel Washington and company are beginning to analyze the evidence from the first murder, Washington verbally lists some of the elements found at the scene including the "iron bolt". A little later, someone mentions "by the way, the bolt is iron, not steel" and Washington is surprised. Continuity mistake: Near the end when Lincoln is being attacked in bed, Richard (Marcus) breaks Lincoln's left index finger. In the final holiday celebration scene, Lincoln's right finger is bandaged and his left is fine.